Snow. If there was one thing the lands of Aluvalia had an abundance of, it was snow. To a foreigner, it was the only thing. The winds threatened to throw you off your feet in their best of moods, and would easily do so if the two feet of snow didn’t anchor you down. Aluvalia was unforgiving. It would take anyone foolish enough to combat the climate for any length of time. Even their footprints would be gone minutes later. Jadis-Sel spent every morning in these perpetual blizzards. As always, there was nothing to see. Even the white of the ground was hard to differentiate from the white of the sky. Today’s weather was temperate, all things considered. He had no trouble standing, a feat that seemed to be growing more and more rare these days. He stroked his beard as the nothingness stared back at him. He returned his gaze to the barren landscape. “Another time, then,” he stated. He bowed slightly before retiring back to the cave where the sentry waited. The black flag that marked the entrance to civilization flapped through the storm. He had put this one up himself the day before. Even with secure tethers in place, flags like this one had to be replaced often. Jadis sighed. No doubt they would ridicule him for being late, while deliberately hiding the news from him for as long as possible. He was tired of these games. Darys jogged up to the tall steel door as they approached. It stood well over fifteen feet tall, with no visible handle or lever. Instead, Darys unsheathed his blade and pushed it into a slot on the wall. He concentrated, channeling magic through the blade. Soon the sound of pistons were heard from within the rock. Soon, the door creaked open. “Thank you again, Darys,” Jadis said once there was enough room to enter through the doorway. “Of course, Jarl. I’ll see you tomorrow,” he saluted. Jadis nodded in appreciation before continuing on his way alone, leaving Darys to his post guarding the entrance. After the echoing silence of the dark, torch lit tunnel, the cavern soon opened up to the colossal depths of the underground city. 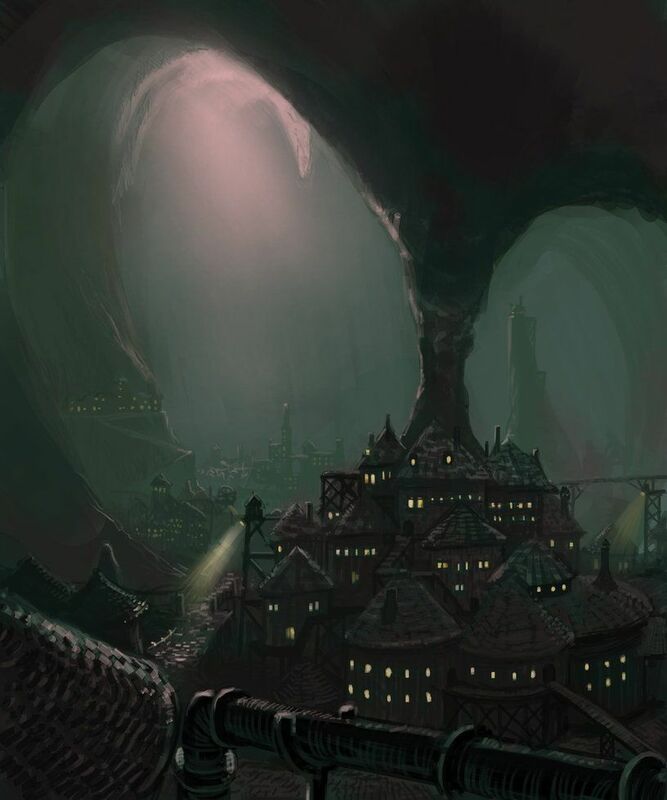 Aluvalia may have been regarded as a barren wasteland to most of Torreth, but Jadis knew from experience that the Luminous Hollow was one of the most densely populated areas of the world. Looking down at the city was a marvel that contrasted so heavily against the white, empty world of above. In truth, it astonished him every day when he returned from his morning walk. In most of the underground cities of Aluvalia, day and night had no meaning. The Luminous Hollow was different, because the cavern wasn’t completely sealed from the outside world. Along the roof of the cave there was a large crack through which some indirect light could shine through. It illuminated the cavern, which gave the city its name, so torchlight wasn’t necessary for the better part of most days. It also allowed winds to flow through, which often provided a pleasant breeze. Jadis walked down the widening path and into the city proper. The sound of music, talking, and the general scuffle of boots across the ground echoed through the streets and brick buildings. Most Aluvalians had long, braided white hair, especially in regards to beards that were, like Jadis’, long enough to be tucked away into tunics of cloth or mammoth fur. As for the women, they focused their time on more intricate braids. It wasn’t unheard of to see people from other parts of the world, here, too, but against the pale whites of the large Aluvalians, even a Kitsuyan looked tan. A few people smiled a little as he passed by them on the stone walkways, but most who recognized him quietly avoided his gaze, stopping what they were doing and giving him extra room as he moved through the dark streets. A dead man walking, in some respects. He had gotten used to that sort of treatment, but either way he was glad fewer and fewer people knew who he was as thees days passed. Receiving sympathy had recently become a part of who he was, and it was intolerable. The sound of a bell rang through the city, echoing across the distant walls of the cavern. It rang twice: the bell toll for midday. Jadis wondered how long the council would have been waiting, but didn’t quicken his pace. If it was urgent they would have taken extra action to ensure his haste. The Clan House was the central structure of all Aluvalian cities: a large, dome building with several stories of various uses. It’s main purpose was government business such as maintaining streets, collecting taxes, or regulating the mines deep below. Council meetings, which were less common, were held on the second story. The third story was a garden: a place that was rarely visited. He walked into the building, guards saluting as he passed, and ascended the stairwell. The stone room was already occupied, blazing torches placed on the numerous columns. Mammoth pelts graced the floors and there were a few maps about the walls: one of the Hollow, one of all of Aluvalia, and a larger, though mostly ignored, one of all of Torreth. Six people sat around the table in large, almost throne-like chairs. Five of the other jarls were already seated, typically representing the largest and most powerful clans, as was custom. The repulsive Sathryon-Maw of the Bear clan, the raucous Rauvin-Bek of the Ibex clan, the laid back Cadock-Tir of the Timberhorn clan, and the ever silent two jarls, Thomri-Moth of the Mammoth clan, and Dagan-Pak of the Great Wolf clan. Jadis represented the Sellis clan, for what it was worth. The sixth seat was occupied by a woman only a fraction of the Aluvalian leaders’ size, and Jadis didn’t recognize her. “There he is!” Cadock-Tir shouted. The others turned to face him. Cadock himself was a cheerful soul. He always bore a smile, even though his hair would soon be too sparse to braid. As for the other jarls, it seemed as though they had just swallowed something distasteful. “Now we can get this over with,” Rauvin-Bek muttered. “Did you see anything interesting on your morning walk?” Sathryon-Maw taunted, stroking his beard with an irksome grin. “Gentleman,” the woman on the other side of the table said. “I would prefer it if we could speak strictly on the matters at hand.” She was obviously from the isles of Kitsuya. Her stark black hair fell straight down upon a pale blue dress, and she spoke with a high-pitched serenity that didn’t match the coarse nature of Aluvalia. She also didn’t quite fit into the chair they had given her. Jadis estimated that she probably weighed about a third of what he did, if not less. “There’s a ‘Foreign Relations’ division?” Sathryon asked, frowning. “There is now. But please, allow me to explain,” she shot him an impatient glare. “This will proceed far more quickly if you do not interrupt.” Sathryon shrugged at that. She paid him no further heed. Clearly, she found him as insufferable as Jadis did. “If you’ll excuse me, Takeya,” Jadis raised a hand, voice calm. “And you can honestly say the Preservers don’t know what caused it?” Rauvin asked. “We don’t know how the heavens tore like that, but it does seem to be related to what happened in Veritia. The Preservers tend to wait for more scientific evidence before they blame the gods for anything. It seems strange that a god would demonstrate his wrath by marking the night sky. But there is one last thing that I haven’t mentioned.” She sat back down, contemplative. This was some pretty fun world building and exposition! I like it. Also, I just realized that everyone would totally think Vijari and kin are just real scrawny Aluvalians! Down to the fact they don’t much respect day/night. Could make for interesting interactions in a couple decades when you get around to writing your 12th novel that introduces them. Round 2, I’ll point out anything that seems off to me. – I think you accidentally combines “in the best of moods” and “in their best mood.” Mood. Mood mood. Moodilly mood mood. Mood. – I believe Jarl should be capitalized here, as it is a name/title? I’m not 100% on that. – Either you’re missing a comma after “like Jadis'” or you just need to rebuild the sentence. Read it out loud and you can see where it probably doesn’t flow like you meant. – That part just seems a bit odd to me, since it doesn’t seem like they could keep it very secret. Wouldn’t Veritian mages have likely been in every nation across the world? Albeit in tiny numbers? I imagine the individual strength of each mage could have played a part, or perhaps there were many factors that made things not obvious (like those who weren’t mages had such subtle deaths that the cause was in fact not obvious). Oh – Proper Nouns, that’s what I meant about using jarl as a name/title. I meant to throw that term in there but forgot. That’s a weird rule I’ve discussed with my writer’s group. You actually DON’T capitalize king if its just the title. If you attach a name to it, however, the title becomes a part of the proper noun. Since jarl in that instance isn’t attached to a name, it isn’t capitalized. Are you sure? I’m pretty sure it’s capitalized when replacing a name. Have you talked to Dad lately? Have you talked to my dad lately? Well I stand corrected. Weird. I must have made up that rule.